The church is named Hato Hemi (St. James). 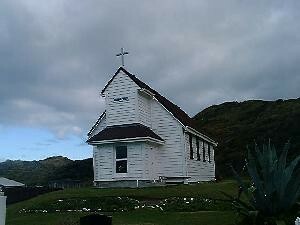 It is Catholic and is the only church in New Zealand which is built on marae land. Mitimiti has one of the most remote beaches you can find on this planet. If you want to forget the rest of the world, this is the place to be. These Beaches are at the same time wild, violent, thundering rough and calm, cool, peaceful relaxing. You can drive with your car along these beaches. If you go North, you will get close to Pawarenga. If you go South, you arrive at the North head of the Hokianga Harbour entrance. Be aware the speed limit is 100 km/h, as these beaches are officially a public road, and you can get fined for speeding. And make sure you travel at low tide.